... 1952, Anita deFrantz (right) was born in Philadelphia, Pennsylvania. She earned her J.D. from Penn Law in 1977. 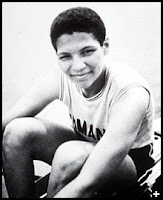 While in law school, deFrantz was a member of the U.S. Women's Rowing Team, serving as captain at the 1976 Olympics in Montreal, Canada, where her team won the bronze medal. Her competitive career ended in 1980, when U.S. President Jimmy Carter withdrew the U.S. team from the Olympic Games in Moscow to protest the Soviet invasion of Afghanistan. Along with other athletes, lawyer DeFrantz sued the U.S. Olympic Committee on the ground that no organization could block an athlete's right to compete. The effort was unsuccessful, and seen as unpatriotic by some at home. But 6 years later she was named a lifetime member of the International Olympic Committee -- the 1st woman and the 1st African American person to be appointed to that body. DeFrantz was the IOC's Vice President -- the 1st woman to hold the position -- from 1997 to 2001.